The goal of this institute is to help teachers to gain a global focus for their teaching and to help their students to understand common environmental and social challenges among the world’s peoples. This institute is for people who are committed to providing others with an understanding of the interdependence of the people and eco-systems around the globe. For the past fifteen years, this project has been carried out with Bay Area classroom teachers, artists, organizers and community activists as they learned about both the local and global implications of current environmental challenges. Part of the institute is a journey to another country to engage in an international educational exchange. During collaborations teaching and community building practices and common life themes are explored and lasting personal and professional relationships are developed. Students in the home classroom of participating teachers can become thoroughly integrated in the journey of their teacher and the process and experiences are also shared with the families and the greater school community. We believe that young people who build first hand connections, with peers in a different countries will grow up developing a critical awareness of their interconnectedness to other people and places around the world. Requirements & Schedule: The Institute spans a three month period and includes a ten-12 day visit to a “developing” country. Institute participants meet approximately one evenings per week and two full Saturdays as the international journey approaches. This enables participants to explore local and global environmental and social issues that will also be infused into classroom and community work.. Selected readings and film viewings are required (both in and out of session time) to build knowledge and understanding of issues relevant to both the local communities and the host country. 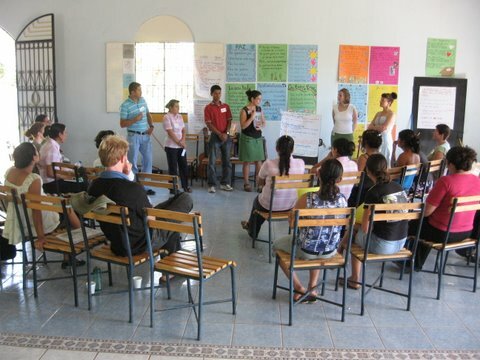 During the international portion, participants engage in an exchange based on interactive teaching strategies, community building, the integration of children’s literature to motivate discussion about important environmental and human rights issues, the authoring and creation of books and the development of a collaborative thematic unit based on an environmental issue of concern to the community in which they are visiting. All participants are prepared in international workshop methodologies. The institute prepares educators to develop guidelines for working together and also to work through translation, if necessary. A great deal of thought and work goes into the preparation for an International Exchange. Sharing creative and interactive ways of encouraging a critical and socially contextualized literacy development, is an essential goal of this project. A strong focus is placed on writing original texts and the creation of books. Through the exploration of environmental, social and global themes, participants learn ways to guide critical discussions with their students and communities that generate ideas that then become the texts from which young people can learn to read and to write. Application Process: Individuals interested in the goals and design of the Institute should write or call to request an application. Selected applicants will participate in an interview with CCEGL Director and members of the board. The cost of the Institute plus the international journey is approximately $1,500. Air fare is not included. Some scholarships are available. Participant Reflections: Two teachers shared the following about their experiences: “I experienced first hand what it was like to not understand a language and this work really helped me to understand better the life of my immigrant families and be a more compassionate teacher and advocate.” (Jeremiah) “Collaboration among teachers is just essential for growth and when you collaborate with teachers in a different country with a different perspective, with different experience, it really just sheds so much light upon your own life and your own practice (Alestra). Journey to Oaxaca, Mexico Spring 2019 Flyer! Oaxaca, Mexico in July. CCEGL is accepting applications for the Spring/Summer Institute, focusing on the themes of Food Sustainability, Water, Climate Chaos and the integration of indigenous culture and language. 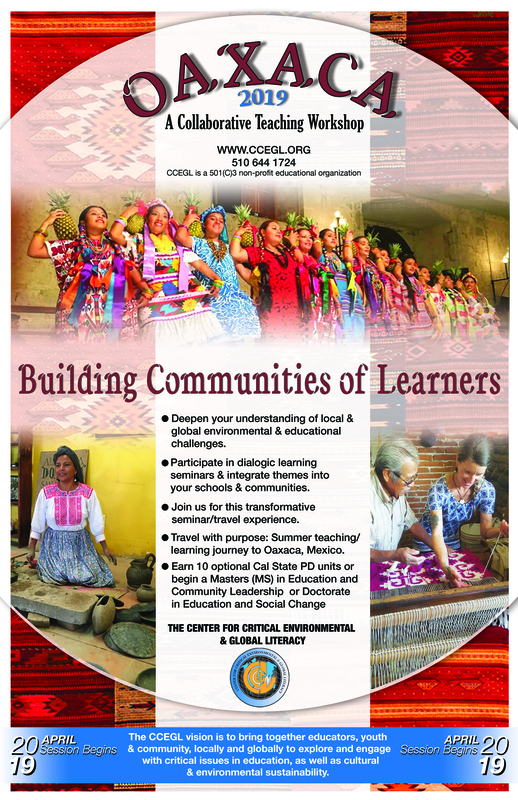 The culmination will be a one week workshop with schools and community educators in Oaxaca, Mexico.